Tesla’s Wireless Electricity: What happened in Tesla’s Life? Tesla was an eccentric individual. He made (what seemed to many to be) crazy claims about what was possible. As is the case with many of history’s smartest minds, Tesla was initially highly regarded. However, by 3/4 of the way through his life, he was ridiculed, rumored about, and eventually regarded as a mad scientist. Post-mortem, he was once again regarded highly. Conspiracy theorists say that the rumors about Tesla were largely false, and that they were spread by those who had once financed Tesla. The ultimate for Tesla, and what he ultimately wanted to create, was wireless electricity for the whole planet. Working towards this goal, Tesla didn’t focus much on the accumulation or management of finances, and despite all his accomplishments, Tesla died with minimal funds at the age of 86 in a two-room hotel suite in New York City. But before then, Tesla led a truly amazing life. Tesla relates in his autobiography how early on in life, he would often experience a strange event where blinding flashes of light and visions would come to him. Often, these visions somehow were associated with words or ideas, which would relate to the problem he was working on at the time. Tesla could see all the pieces of what worked in an invention in realistic detail. In his mind, he could see how all the pieces would work together, including all the dimensions, before ever drawing or constructing anything. On the opening of the telephone exchange in Budapest, 1881, Tesla became the chief electrician to the company. He was later an engineer for the Austria/Hungary’s first telephone system. He also developed a device that, according to some, was a telephone repeater or amplifier, but according to others could have been the first loudspeaker. Tesla worked as an engineer for the Continental Edison Company in Paris. He designed many improvements to electric equipment that had been brought to Europe from America. According to Tesla’s autobiography, in 1882 he developed the induction motor and began developing various devices that use rotating magnetic fields. He was granted patents for many of these ideas in 1888. On 6 June 1884, Tesla first arrived in the United States. Edison hired Tesla to work for his Edison Machine Works. Tesla’s work for Edison began with simple electrical engineering and quickly progressed to solving some of the company’s most difficult problems. Tesla was even offered the task of completely redesigning the Edison company’s direct current (DC) generators, and Tesla claimed he was offered US$50,000 (~ US$1.1 million in 2007, adjusted for inflation). Tesla completed this work for Edison. However (reportedly) when it came time for Edison to pay Tesla, Edison replied, “Tesla, you don’t understand our American humor,” and didn’t pay him. At the time, Tesla earned US$18 per week. At $18/week, Tesla would have had to work for 53 years to earn the amount he was promised. Tesla requested a raise to $25/week since he had done good work for the company, but the request was not granted. Tesla eventually found himself digging ditches for a short period of time for the Edison company to raise money for and focus on building an Alternating Current Polyphase system, which modern electrical systems are based on today. Can you imagine how Tesla must have felt, knowing that his contributions to Edison’s company, and the increased efficiencies, wouldn’t rewarded with an increase in pay? An alternative explanation is that it may have been the only work that Tesla could find at the time. In 1886, Tesla formed his own company, Tesla Electric Light & Manufacturing. The initial financial investors disagreed with Tesla on his plan for an alternating current motor and eventually relieved him from working at his company. Tesla worked in New York as a laborer from 1886 to 1887 to feed himself and raise capital for his next project. 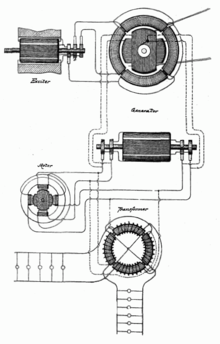 In 1887, he constructed the initial brushless alternating current induction motor. In the same year, he developed the principles of his Tesla coil, and began working with George Westinghouse at Westinghouse Electric & Manufacturing Company’s Pittsburgh labs. Westinghouse listened to his ideas for polyphase systems which would allow transmission of alternating current electricity over long distances. The rest of Tesla’s story is absolutely fascinating. But what is most interesting about Tesla’s early work is that he actually worked for Edison. Not rewarding Tesla for his work, Edison later lost to Tesla in the war of currents. However, it seems Edison may have won in terms of overall fame and reputation, as Edison’s name is more known than Tesla’s by people today. Tomorrow: What happened at the Wardenclyffe Tower? And why was Tesla’s second tower torn down by the American government in 1917? Wind and solar we can help you with. Magic, not so much. What ways have you seen here on the site or elsewhere so far?